Chicken pickin’ guitar is a style made famous by players like James Burton, Albert Lee, and more recently Brad Paisley and Brent Mason. We’re going to look at some chromatic country licks for chicken pickin’. Many people think country music is way too simple, nothing really happening harmonically. That may be true in terms of the chord progressions – country music is usually a variation of I, IV, and V.
But there is a lot happening within the lines. And… honestly, more people listen to ‘simple music’ than complicated music! Let’s get into some of these harmonically adventurous country licks. The first lick we will look at is from UK chicken picker, Albert Lee. This one is just over the A major chord. He is using a ‘hybrid’ scale – a combination of the blues scale and the mixolydian scale. Chromatic notes are typically notes that lead into a note. In other words, they add interest to the line and then resolve into a chord or scale tone. In the second bar here, Lee chromatically leads into the D note, and then chromatically leads up to the C#. The 4th bar he also chromatically moves from 5 down to 4 in the chord (E down to D). This is really the most important rule using chromatics – resolve to a chord or scale tone. Next we will move to the more recent chicken pickin’ shredder, Brad Paisley. Paisley has blazingly fast technique and can be tough to replicate. This lick moves us from a D chord to a G. The first bar is over a G chord, notice the chromatic movement into and out of the B and D double stop. He simply moves into it and back out of it using chromatic notes. He then prepares the G chord by sliding into the root and 3rd from a chromatic double stop below. Finally we will look at a lick by Merle Haggard’s most recent guitarist, Redd Volkaert. Redd is one of the unsung heroes of country guitar these days. This lick again uses double stop thirds. We are going from an A chord to a D chord. He moves chromatically down in the first bar, first two beats. He uses them pretty extensively in the second bar as well, moving down towards the final resolution in the third bar. Chromatic notes will almost always sound ‘right’ when you’re moving from something to something. Remember, it’s all about the resolution. 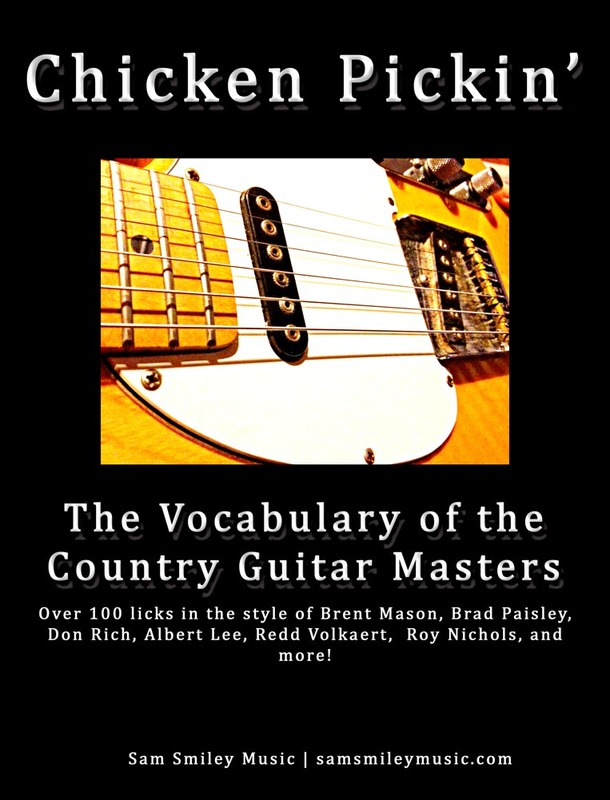 If you’re interested in working on a ton of chicken pickin’ licks, make sure to check out my new book, Chicken Pickin’ – the Vocabulary of the Country Guitar Masters. It takes you through the history of chicken pickin’ and helps you put all of these great licks into context. Sound authentic immediately!